This chapter explains the architecture and features of CUBRID. CUBRID is an object-relational database management system (DBMS) consisting of the database server, the broker, and the CUBRID Manager. It is optimized for Internet data services, and provides various user-friendly features. System Architecture: This page contains information about database volume structure, server process, broker process, interface modules, etc. Features of CUBRID: This page contains information about transaction, backup and recovery, partitioning, index, HA, Java stored procedure, click counter, relational data model extension, etc. CUBRID is an object-relational database management system (DBMS) consisting of the database server, the broker, and the CUBRID Manager. As the core component of the CUBRID database management system, the database server stores and manages data in multi-threaded client/server architecture. The database server processes the queries requested by users and manages objects in the database. The CUBRID database server provides seamless transactions using locking and logging methods even when multiple users use the database at once. It also supports database backup and restore for the operation. The broker is a CUBRID-specific middleware that relays the communication between the database server and external applications. It provides functions including connection pooling, monitoring, and log tracing and analysis. The CUBRID Manager is a GUI tool that allows users to remotely manage the database and the broker. It also provides the Query Editor, a convenient tool that allows users to execute SQL queries on the database server. For more information about CUBRID Manager, see http://www.cubrid.org/wiki_tools/entry/cubrid-manager. CUBRID Query Browser is a light version of CUBRID Manager and provides only the features which application developers require: the database management and query editor features. For more details on CUBRID Query Browser, see http://www.cubrid.org/wiki_tools/entry/cubrid-query-browser . The following diagram illustrates the CUBRID database volume structure. As you can see, the database is divided into three volumes: permanent, temporary and backup. This chapter will examine each volume and its characteristics. For commands to create, add or delete the database volume, see createdb, addvoldb and deletedb. Permanent volume is a database volume that exists permanently once it is created. Its types include generic, data, temp, index, control, active log and archive log. For efficient management, the volume type to be added to the database can be specified as one of the following: data, temp or index. If the volume type is not specified, it is specified as a generic volume and it stores data and index. However, schema is stored only on the generic volume; there is no specific volume type for storing schema. It is specified as the generic volume when a volume is automatically increased. Data volume is a space for storing data such as instances, tables and multimedia data. Temp volume is a space where the intermediate and final results of query processing and sorting are temporarily stored. It is also called the permanent temp volume to distinguish it from the temporary temp volume that will be described below. The temp volume is a permanently-occupied space, meaning that data in the space is temporary stored and later destroyed. Therefore, when CUBRID restarts, the data in the temp volume space is initialized and the related log information is removed. When executing the queries above, the temp volume is used after exhausting the memory space (the space size is determined by the system parameter temp_file_memory_size_in_pages specified in cubrid.conf) assigned to store SELECT results or sort the data. The order in which the storage space is used to store the results of query processing and sorting is as follows: When the current storage space is exhausted, the next storage space is used. Index volume is a space that holds the index information for query processing or integrity constraint checks. The control file contains the volume, backup and log information in the database. Volume Information: The information that includes names, locations and internal volume identifiers of all the volumes in the database. When the database restarts, the CUBRID reads the volume information control file. It records a new entry to that file when a new database volume is added. Backup Information: Locations of all the backups for data, index, and generic volumes are recorded to a backup information control file. This control file is maintained where the log files are managed. Log Information: This information contains names of all active and archive logs. With the log information control file, you can verify the archive log information. The log information control file is created and managed at the same location as the log files. Control files include the information about locations of database volumes, backups and logs. Since these files will be read when the database restarts, users must not modify them arbitrarily. Active log is a log that contains recent changes to the database. If a problem occurs, you can use active and archive logs to restore the database completely up to the point of the last commit before the occurrence of the fault. Archive log is a volume to store logs continuously created after exhausting available active log space that contains recent changes. If the value of system parameter log_max_archives is larger than 0, the archive log volume will be generated only after exhausting available active log volume space. The initial value is set to 0 when installing CUBRID. The number of archive log files is kept on the storage by setting the value of log_max_archives. The unnecessary archive log files should be deleted for getting the free space by the configuration of log_max_archives, but this value should be set properly to use for restoring the database. To get more information on the above, see Managing Archive Logs. Background archive log is a volume used in the background with log archiving temporarily before creating archive logs. It is created as the same volume size as active log and stored. Temporary volume has the opposite meaning to the permanent volume. That is, the temporary volume is a storage created only when the accumulated data exceeds the space specified by the user as the permanent volume. The temporary volume is destroyed when the server process terminates. One of such volumes created or destroyed temporarily is the temporary temp volume. Temporary temp volume is a temporary volume created temporarily by the system after exhausting the space specified as the permanent temp volume, whereas the temporary volume belongs to the permanent volume with the permanent space specified. Because cost to create a temporary temp volume is high, DBA should assign an appropriate size of volume depending on situation to enhance performance. DBA should consider space where temporary temp volume can be created when creating a database. Once temporary temp volume is created, it is maintained until a database restarts and its size cannot be reduced. It is recommended to make temporary temp volume automatically delete by restarting a database if its size is too big. File name of the temporary temp volume: The file name of the temporary temp volume of CUBRID has the format of db_name_tnum, where db_name is the database name and num is the volume identifier. The volume identifier is decremented by 1 from 32766. Configuring the temporary temp volume size: The number of temporary temp volumes to be created is determined by the system depending on the space size needed for processing transactions. However, users can limit the temporary temp volume size by configuring the temp_file_max_size_in_pages parameter value in the system parameter configuration file (cubrid.conf). The default value is -1, which means it can be created as long as free space is available. If the temp_file_max_size_in_pages parameter value is configured to 0, the temporary temp volume will not be created even after exhausting the permanent temp volume. 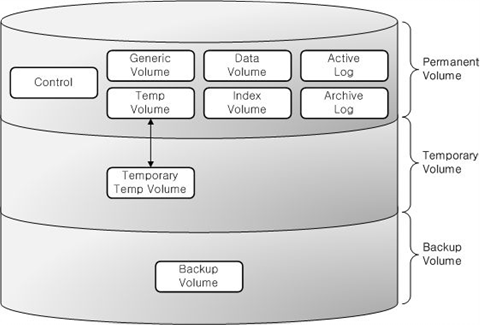 Configuring storing location of the temporary temp volume: By default, the temporary temp volume is created where the first database volume was created. However, you can specify a different directory to store the temporary temp volume by configuring the temp_volume_path parameter value. Deleting the temporary temp volume: The temporary temp volume exists temporarily only while the database is running. Therefore, you must not delete the temporary temp volume when running servers. The temporary temp volume is deleted if database servers are normally terminated while it is deleted when the servers restart if database servers are abnormally terminated. Backup volume is a database snapshot; based on such backup and log volumes, you can restore transactions to a certain point of time. You can use the cubrid backupdb utility to copy all the data needed for database restore, or configure the backup_volume_max_size_bytes parameter value in the database configuration file (cubrid.conf) to adjust the backup volume partitioning size. Each database has a single server process. The server process is the core component of the CUBRID database server, and handles a user's requests by directly accessing database and log files. The client process connects to the server process via TCP/IP communication. Each server process creates threads to handle requests by multiple client processes. System parameters can be configured for each database, that is, for each server process. The server process can connect to as many client processes as specified by the max_clients parameter value. The master process is a broker process that allows the client process to connect to and communicate with the server process. One master process runs for each host. (To be exact, one master process exists for each connection port number specified in the cubrid.conf system parameter file.) While the master process listens on the TCP/IP port specified, the client process connects to the master process through that port. The master process changes a socket to server port so that the server process can handle connection. All CUBRID programs except the server process have two modes: client/server mode and standalone mode. In client/server mode, applications access server processes by operating themselves as client processes. In standalone mode, applications include functionalities of server processes so that the applications can access database files by themselves. For example, database creation and restore utilities run in standalone mode so they can use the database exclusively by denying the access by multiple users. Another example is that the CSQL Interpreter can either connect to the server process in client/server mode or execute SQL statements by accessing the database in standalone mode. Note that one database cannot be accessed simultaneously by server processes and standalone programs. 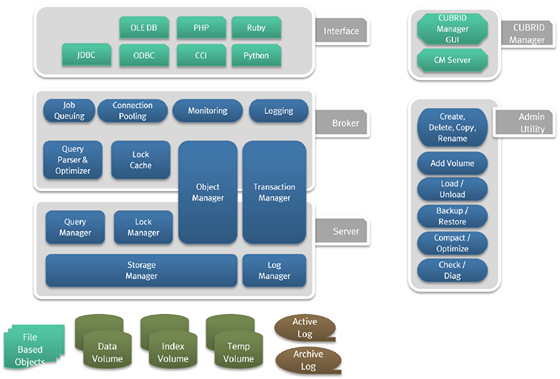 The broker is a middleware that allows various application clients to connect to the database server. 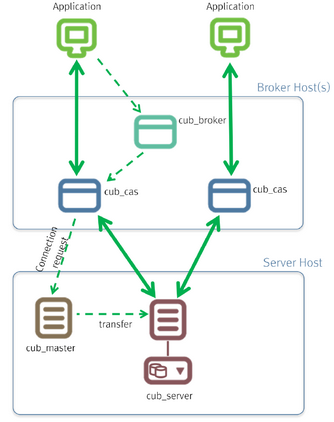 As shown below, the CUBRID system, which includes the broker, has multi-layered architecture consisting of application clients, cub_broker, cub_cas, and cub_server (database server). The interfaces that can be used in application clients include C-API (CCI, CUBRID Call Interface), ODBC, JDBC, PHP, Python, Ruby, OLE DB, ADO.NET, Node.js, etc. cub_cas (CUBRID Common Application Server and broker application server (CAS in short)) acts as a common application server used by all the application clients that request connections. cub_cas also acts as the database server's client and provides the connection to the database server upon the client's request. The number of cub_cas(s) running in the service pool can be specified in the cubrid_broker.conf file, and this number is dynamically adjusted by cub_broker. cub_cas is a program linked to the CUBRID database server's client library and functions as a client module in the database server process (cub_server). In the client module, tasks such as query parsing, optimization, execution plan creation are performed. cub_broker relays the connection between the application client and the cub_cas. That is, when an application client requests access, the cub_broker checks the status of the cub_cas through the shared memory, and then delivers the request to an accessible cub_cas . It then returns the processing results of the request from the cub_cas to the application client. The cub_broker also manages the server load by adjusting the number of cub_cas (s) in the service pool and monitors and manages the status of the cub_cas. If the cub_broker delivers the request to cub_cas but the connection to cub_cas 1 fails because of an abnormal termination, it sends an error message about the connection failure to the application client and restarts cub_cas 1. Restarted cub_cas 1 is now in a normal stand-by mode, and will be reconnected by a new request from a new application client. The status information of the cub_cas is stored in the shared memory, and the cub_broker refers to this information to relay the connection to the application client. With the status information stored in the shared memory, the system manager can identify which task the cub_cas is currently performing or which application client's request is currently being processed. JDBC: A standard API used to create database applications in Java. ODBC: A standard API used to create database applications on Windows. ODBC driver is written based on CCI library. OLE DB: An API used to create COM-based database applications on Windows. OLE DB provider is written based on CCI library. PHP: CUBRID provides a PHP interface module to create database applications in the PHP environment. PHP driver is written based on CCI library. CCI: CCI is a C language interface provided by CUBRID. The interface module is provided as a C library. All interface modules access the database server through the broker. The broker is a middleware that allows various application clients to connect to the database server. When it receives a request from an interface module, it calls a native C API provided by the database server's client library. You can find the latest information on interface modules; visit the Web site at http://www.cubrid.org/wiki_apis. CUBRID supports the following features to completely ensure the atomicity, consistency, isolation and durability in transactions. A database backup is the process of copying CUBRID database volumes, control files and log files; a database restore is the process of restoring the database to a certain point in time using backup files, active logs and archive logs copied by the backup process. For a restore, there must be the same operating system and the same version of CUBRID installed as in the backup environment. The backup methods which CUBRID supports include online, offline and incremental backups; the restore methods include restore using incremental backups as well as partial and full restore. CUBRID supports the following index functions to utilize indexes while executing a variety of conditional queries. Descending Index Scan: Descending Index Scan is available only with Ascending Index Scan, without creating separate descending indexes. Covering Index: When the column of a SELECT list is included in the index, the requested data can be obtained with an index scan. ORDER BY clause optimization: If the required record sorting order is identical to the order of indexes, no additional sorting is required (Skip ORDER BY). GROUP BY clause optimization: If all columns in the GROUP BY clause are included in the indexes, they are available to use while executing queries. Therefore, no additional sorting is required (Skip GROUP BY). CUBRID provides High Availability(HA) feature to minimize system down time while continuing normal operation of server in the event of hardware, software, or network failure. The structure of CUBRID HA is shared-nothing. CUBRID monitors its system and status on a real time basis with the CUBRID Heartbeat and performs failover when failure occurs. It follows the two steps below to synchronize data from the master database server to slave database server. In the Internet environment, it is common to store and keep counting information like page view in the database to track search history. The above scenario is generally implemented by using the SELECT and UPDATE statements; SELECT retrieves the data and UPDATE increases the number of clicks for the retrieved queries. This approach can cause significant performance degradation due to increased lock contention for UPDATE when a number of SELECT statements are executed against the same data. To address this issue, CUBRID introduces the new concept of the Click Counter that will support optimized features in the Web in terms of usability and performance, and provides the INCR() function and the WITH INCREMENT FOR statement. For the relational data model, it is not allowed that a single column has multiple values. In CUBRID, however, you can create a column with several values. For this purpose, collection data types are provided in CUBRID. The collection data type is mainly divided into SET, MULTISET and LIST; the types are distinguished by duplicated availability and order. SET: A collection type that does not allow the duplication of elements. Elements are stored without duplication after being sorted regardless of their order of entry. MULTISET: A collection type that allows the duplication of elements. The order of entry is not considered. LIST: A collection type that allows the duplication of elements. Unlike with SET and MULTISET, the order of entry is maintained. Inheritance is a concept to reuse columns and methods of a super class (table) in those of a sub class. CUBRID supports reusability through inheritance. By using inheritance provided by CUBRID, you can create a super class with some common columns and then create a sub class inherited from the super class with some unique columns added. In this way, you can create a database model which can minimize the number of columns.